Your organization has either; BEEN attacked, is currently BEING attacked or WILL BE attacked by cyber criminals. Our mission is to provide you the knowledge, the vision, and the solutions to secure your assets. Pine Cove Consulting has been a Sophos security partner for 15 years. In 2016, Pine Cove Consulting was named "Complete Security Partner of the Year." Sophos is our partner for all of our cyber-security solutions. Pine Cove Consulting provides their clients with next-gen cyber-security solutions which protect against even the most sophisticated cyber-attacks. Pine Cove Consulting has the capability of providing organizations with full cyber protection from the endpoint to the firewall and everything in between. Pine Cove's comprehensive solution, Synchronized Security, ensures that your assets will never be compromised and you can sleep a bit easier at night. Upgrading and implementing your technology infrastructure can be complex and sophisticated. Your users expect your technology to work day in and day out, without flaw. Without the proper infrastructure, your organization can be plagued with technology problems. 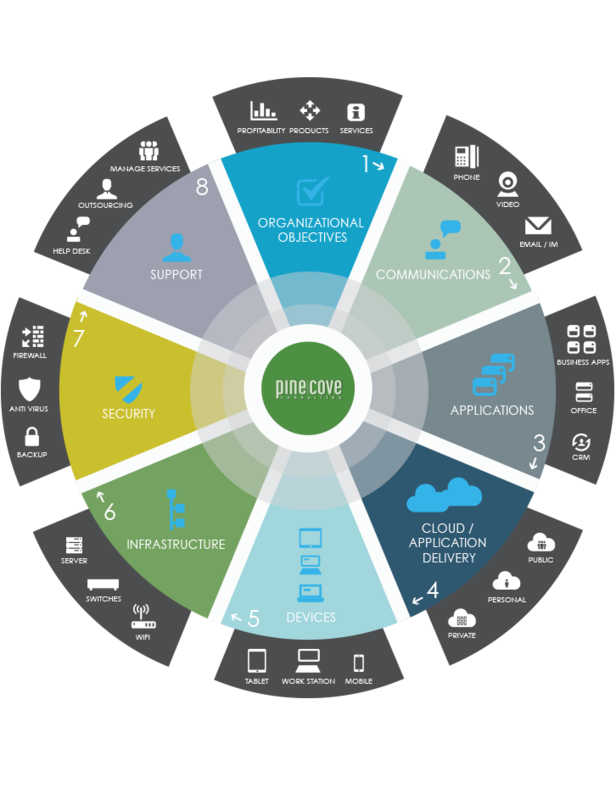 Pine Cove Consulting has implemented hundreds of efficient and effective infrastructure solutions for all types of organizations. If you need to implement network, switches, or wireless technology into your organization's infrastructure, look no further. We personalize our solutions by first, understanding your technology vision and then, implementing a solution that goes above and beyond your expectations. Pine Cove Consulting can help your business, educational institution, or government agency address any current infrastructure problems you may be experiencing, or help you create a brand new infrastructure plan altogether. Pine Cove Consulting has strategic partnerships with Ruckus Wireless and Brocade to ensure that every client is satisfied with their technology infrastructure. Upgrade your phone system, video conferencing technology, and email provider, to meet your communication demands. Your organization depends on communication for day-to-day activities. Pine Cove Consulting has developed a strong partnership with the world's most premier communication technology companies. Investing in new communication technology can save time, money, and resources for your organization. Is it time to synchronize your company emails on one platform? Or maybe you want the latest and greatest VOIP phone technology? Looking to add video conferencing to your communication repertoire? Pine Cove Consulting has the solution for you. New technology such as Lifesize's video conferencing technology or Zultys' VOIP phones, are just a few of the ways Pine Cove Consulting can help you improve your current communication strategy. Pine Cove Consulting understands the value of communication to any organization. Pine Cove Consulting themselves have over 20 employees stationed in 10 different locations. Communication barriers can significantly affect any organization. Let Pine Cove Consulting assist your organization in implementing a solution that works for you. Want more information on our solutions? Contact us for a demo and free consultation.